For years I have enjoyed meals at St John Bread & Wine in Commercial St and although I have always been impressed by this smooth operation, I never exactly knew who was running the ship. 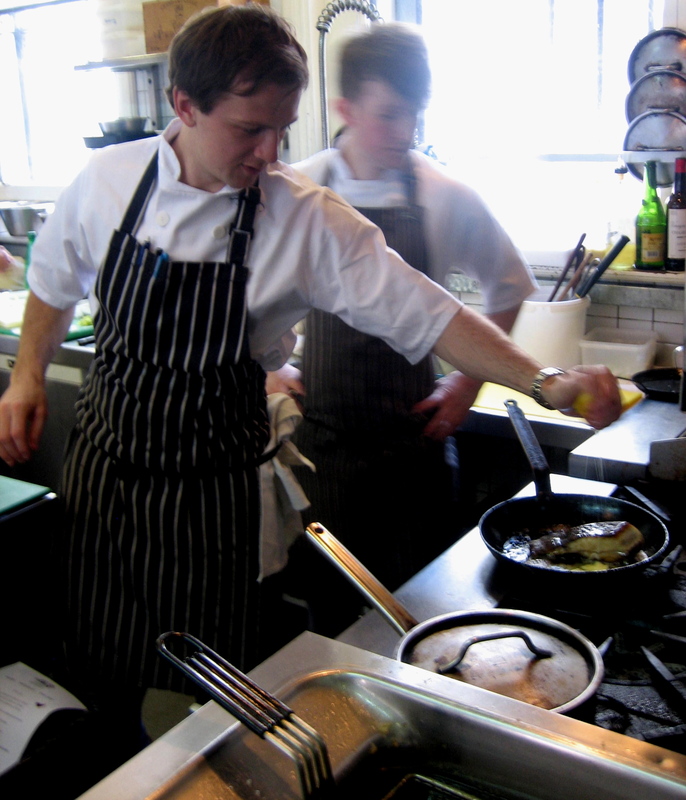 So, this week I went in to meet James Lowe who has been Head Chef here for more than three years now. If I had simply opened my eyes, I should have realised immediately who was in charge, because on most days you will see James standing behind the counter in the kitchen – commanding the helm of his vessel – with his sous chef to his right and the chef supervising the ovens upon his left. From this central point, James can see the whole restaurant and beyond to the passing traffic of Commercial St. Standing next to James for the duration of a lunch service this week, I quickly sensed the excitement of this favoured location. The still point of our turning world in Spitalfields, St John Bread & Wine restaurant occupies the central position, both in terms of culture and topography – with the Market opposite, the Church to the left and The Golden Heart to the right. At the centre of this particular universe, James presides attentively, ensuring that all is well in the kitchen. The waiters deliver your orders to James and he lines up the pink slips of paper upon the front of the metal shelf, scratching his chin as he scrutinises them, working out the correct order of things. 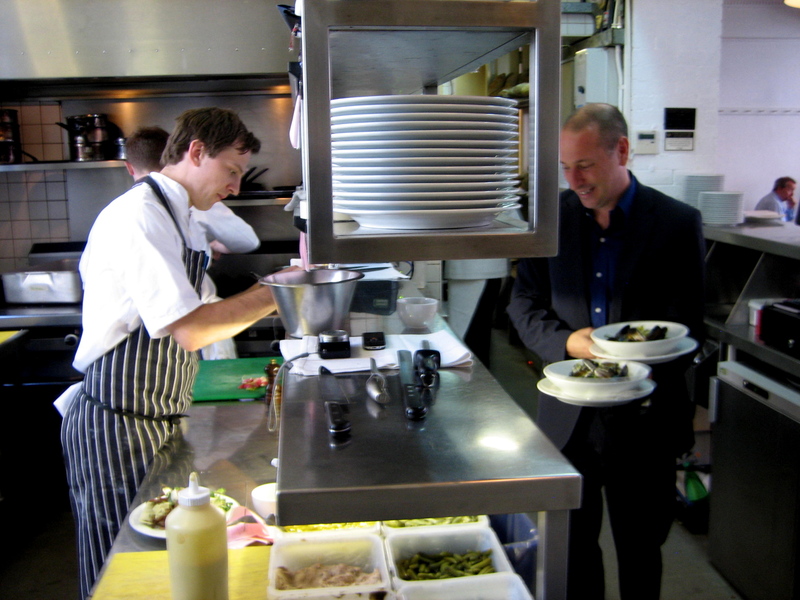 With salad coming from one side and cooked food from the other direction, James puts the dishes together on the counter, sliding the slips of paper from left to right as they become ready to serve. 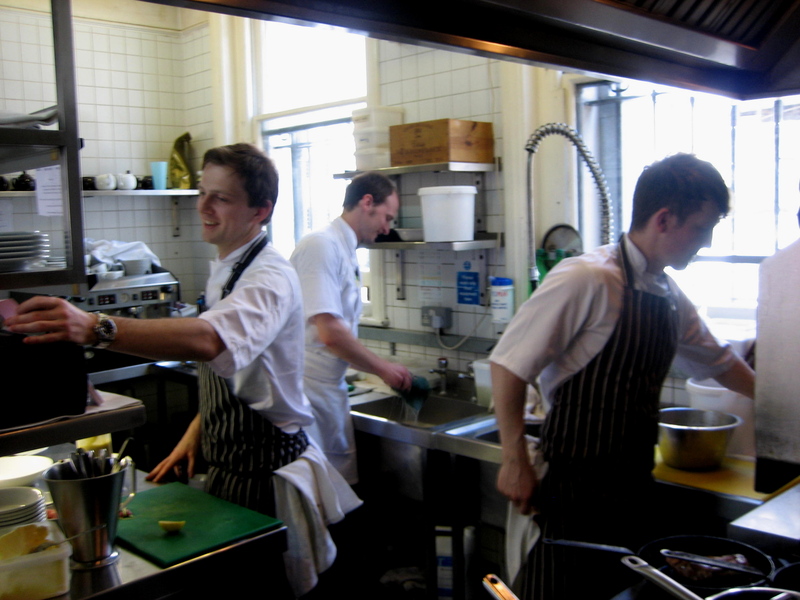 Everything is done with relaxed efficiency and the trio maintain a constant changing dance, that forms and reforms throughout the lunch service. There are escalations of energy, there are flames, and even moments of stillness, and when James calls “Service”, the waiter whisks the plate away to your table and James puts the completed order on the spike. When James shakes your hand and looks you in the eye, you are immediately aware of how intensely present in the moment he is. This quality, combined with a natural openness, creates a striking first impression. James told me he originally set out to be a pilot, but he thought otherwise after the events of 9/11 and became a chef. Even though I would trust James to fly me across the Atlantic safely and with minimal turbulence, I am convinced that he made the right decision. “This is my favourite restaurant in London,” James declared, “that’s why I came to work here.” A bold statement plainly spoken with the absolute, yet not immodest tone, that is his style. “I came to eat at St John and I thought, ‘I’ve got to find out how this is done.’” he revealed, confiding the origin of his grand passion. 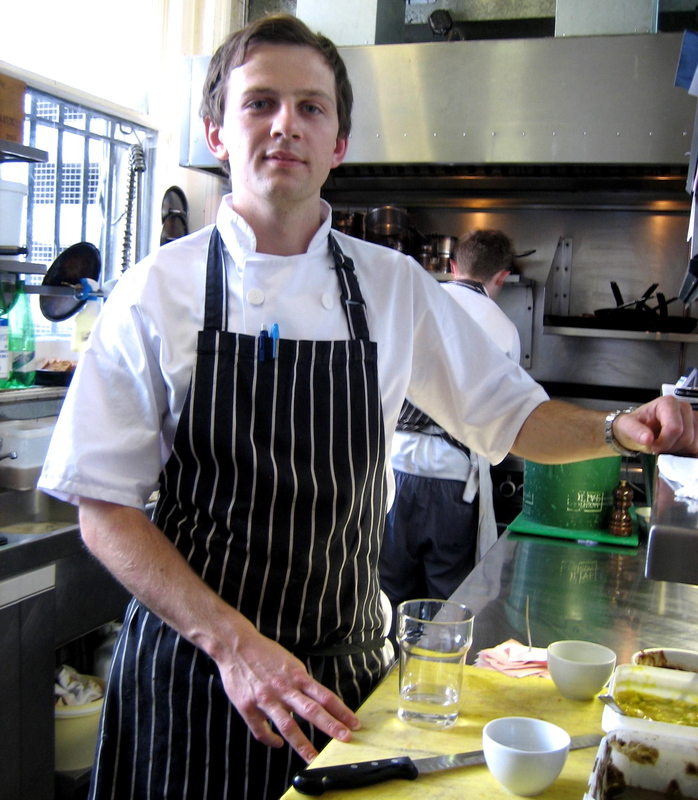 Within a few short years, James moved from the Wapping Project to La Trompette in Chiswick, Heston Blumenthal’s Fat Duck by way of The River Cafe and arrived here at St John Bread & Wine, full of vitality and creative ideas. St John in Spitalfields suits James rather than the Smithfield restaurant, because he is as interested in vegetables as in fish and meat. An enthusiasm reflected in the choice of peas in the pod served raw this week, and the unique range of wild leaves – purslane, sea aster, rock samphire, marsh samphire and sorrel – collected by St John’s own forager, and served fresh to bring extra piquancy to cooked fish and meat. During a quiet moment in the lunch service, James let me taste each of these leaves and I was fascinated by the varieties of subtle tangy peppery flavours they offered. “The produce we use here is the best of anywhere I’ve worked” admitted James, who always carries his mobile with him to maintain contact with suppliers, including Farmer Tom who was imminently expected with lambs and Ben the fish dealer who rings at ten each morning to report the day’s catch. 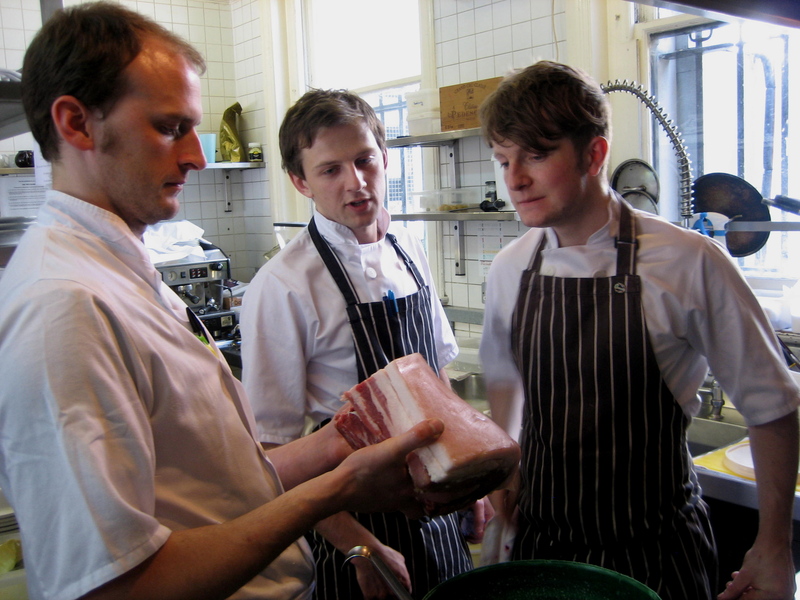 James puts fresh fish on the menu each night at seven, landed that morning and delivered by Ben at seven. An arrangement that ensures freshness, yet can very occasionally yield unexpected dramas if Ben gets stuck in traffic. Before lunch service began, we enjoyed a brief conference on the art of menu writing, which proved an enlightening introduction to the wider challenge of James’ role. Twice every day the menu is rewritten, taking into account the lyrical contrasts and variety that the restaurant is famous for, and exploiting the culinary possibilities of each season too. But more than this immediate prospect, James is always thinking ahead with his orders and doing preparatory work, making soups, and marinating meat and fish, ready for tomorrow or the next day. Add to this, the fact that St John never reheats food – some meat is slow cooked for up to eight hours and served when it is ready – and you begin to realise what a huge logistical exercise it is. 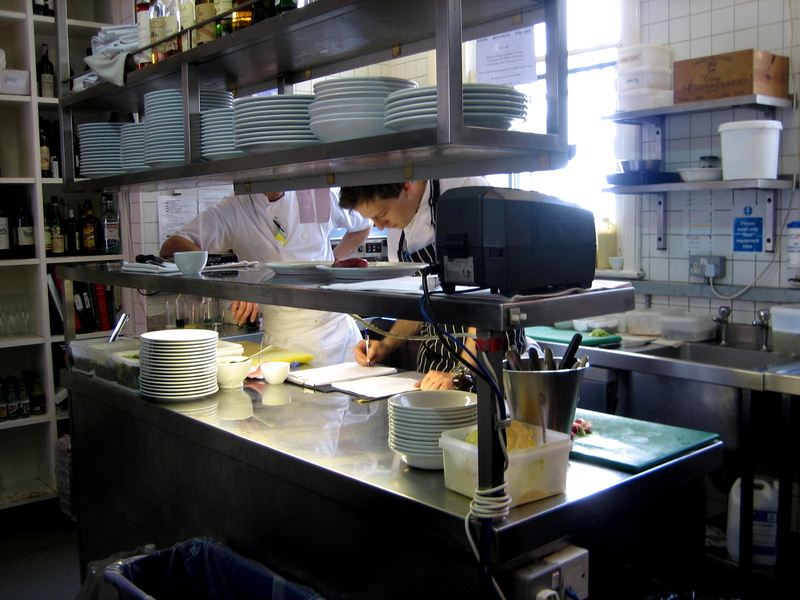 As James blithely took me through his MEP (mise en place) list, the tasks that are necessary for the dishes on next day’s menu to be ready, with every job assigned to a different member of staff, my head began to swim. 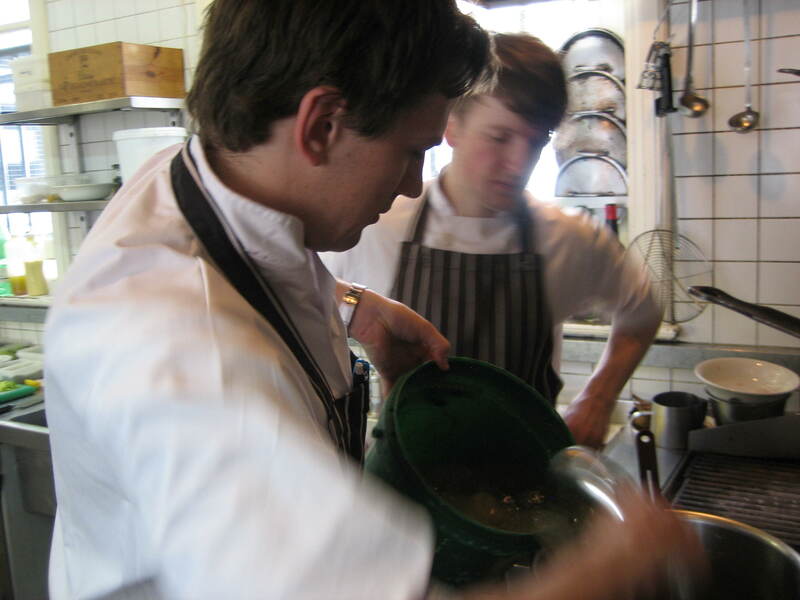 Yet James holds the entire process in his mind comfortably, fourteen evolving menus each week, ordering from suppliers, choreographing the tasks and ultimately bringing it all to the plate with such eloquent clarity that the quality of the food speaks for itself. This is what I love about St John, the artful simplicity of the dishes, presented in a unelaborated style, allows you to savour the ingredients for their true distinctive flavour. And now I know who is the talent responsible for this subtle art that conceals its own sophistication.